It’s almost Labor Day, one of the busiest travel times for Americans. When you think about travel tips for older Americans, navigating through airports and unfamiliar cities comes to mind. But there are so many things seniors can do to prepare for a trip before they leave that will help them stay safe and secure too. With all the security procedures in place and the recent airline delays, take note of the policies for missing flights or having to cancel reservations due to unforeseen events. Flight and hotel insurance is something to think about to give you peace of mind. Carry a list of your medications and what they are for. If you need emergency care, having this information handy can be a huge help to medical practitioners who are unfamiliar with you and your needs. This is especially true in foreign countries. Check your health insurance coverage before your go. 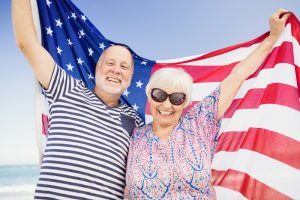 Medicare will not cover you overseas, so the government recommends seniors purchase health coverage for the duration of any overseas trip. If you are traveling in the U.S., check to make sure you can visit emergency rooms or physicians in your destination if needed. Call your credit card companies to tell them about your travel plans. This is important due to the fraud protection services banks are offering. If you are going to an area the bank deems out of character, they may put a temporary hold on your account. Let them know where and when you will be out of the area and they will keep a close watch on your account. If you are concerned about your senior or adult loved one traveling alone, inquire about FirstLight Home Care’s Travel Companion Services Program. Our experienced and certified caregivers can accompany seniors or those with disabilities on short or long trips, giving you and your loved one peace of mind.